New Delhi: India, which has long sought to protect local power equipment makers from their Chinese rivals, is dragging its feet over an application from Shanghai Electric Power Co. Ltd to set up a service centre in the country. The 18-month wait for this application is just one of the many difficulties faced by Chinese firms trying to do business in India and comes in the background of mounting tension between the two fastest growing economies in the world. China’s stand, described by finance minister Pranab Mukherjee as the country’s “old stand" on Arunachal Pradesh, was promptly rejected by India. 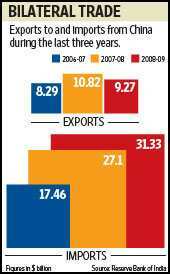 Still, relations between India and China—the latter exported $31.33 billion (Rs1.46 trillion today) worth of goods to India in 2008-09—in the business domain have never been free of the same friction that characterizes diplomatic ties between the two. Some Chinese firms have complained of bias against them arising from so-called security issues and which prevents them from winning significant contracts here. And Chinese workers do find it increasingly difficult to secure visas. Mint had reported on 29 September that the India Meteorological Department has been forced to look for indigenous alternatives after the navy, citing security concerns, refused to allow the installation of a China-made radar on its land in Mumbai. Indian telecom operators have similarly been instructed by the government to avoid using equipment from Chinese manufacturers and vendors in border areas. And Chinese firms are not allowed to bid for hydroelectric power project contracts in border areas. However, in the case of Shanghai Electric, India’s concerns would appear to have more to do with economic than security concerns. “Shanghai Electric wants to open a service centre in India for which approval has been pending for around 18 months. The Indian home ministry has raised some issues. A service centre in the country would have helped the company in providing better comfort to its customers on the important aspect of service and spares," said a senior government official familiar with the development, but who did not want to be identified. A service facility in India would have augmented the Chinese firm’s chances of winning more orders in an economy that aims to add around 100,000MW by 2017. A power ministry official, who too did not want to be identified, said his ministry would follow the home ministry’s advice. Strategic analysts see nothing unusual or wrong in India’s behaviour. Brahma Chellaney, professor of strategic studies at the Centre for Policy Research, a New Delhi-based think tank, said: “As long as China puts diplomatic and military pressure on India, it will be difficult for the Indian government to be forthright on commercial issues. This should be put into perspective at a strategic level. What other leverage does India have to ensure that China improves its conduct?" 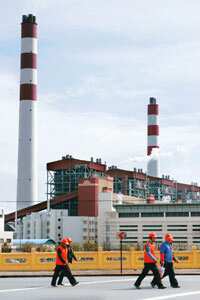 Several Indian power project developers have placed orders with Chinese firms, largely on account of the inability of local manufacturers to meet growing demand for equipment. Chinese equipment is relatively inexpensive and immediately available. Questions emailed to a spokesperson of the home ministry on Monday and an L&T spokesperson on 5 October remained unanswered at the time of filing this story. B.P. Rao, chairman and managing director of Bhel, denied that his firm was against Chinese competition, but said that any “equipment not manufactured in India has service concerns". Union power secretary H.S. Brahma told Mint that his ministry had received representations from Indian firms to limit the presence of Chinese players in the sector. While the Chinese embassy in New Delhi asked Mint to directly speak with the company, questions emailed to Shanghai Electric on 2 October remained unanswered till late Tuesday evening. The Indian representative of Shanghai Electric who promised responses to Mint’s queries emailed on 2 October, hadn’t responded till late Tuesday evening. Indian power generating firms have placed orders for equipment to generate 22,000MW with Chinese firms such as Shanghai Electric, Dongfang Electric Corp. and Harbin Power Equipment Co. Ltd. These companies are also sitting on so-called letters of intent (or intent to order) from Indian firms for equipment to the tune of 25,000MW.